It’s actually still running, at my parents as their router/firewall/print server with Red Hat 9, but it really needs replacing at some stage. 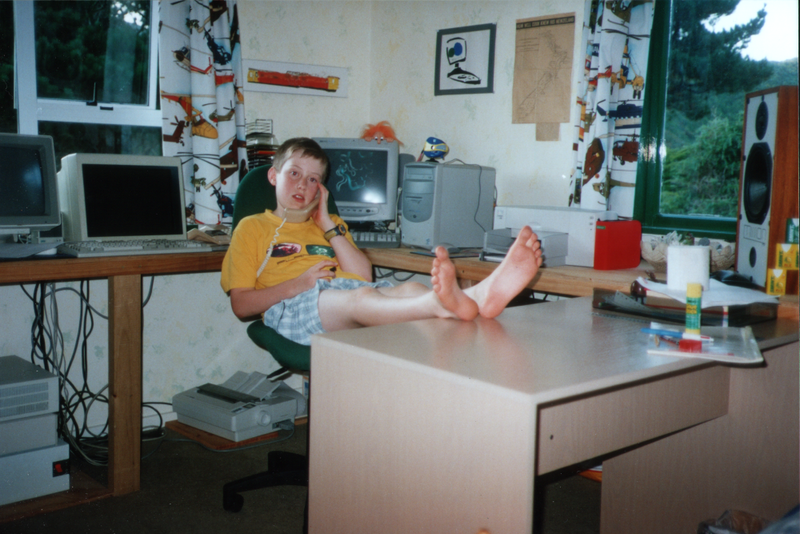 Here’s a picture of it in the background behind a much younger version of myself busy discussing matters of vital importance, such as the coolest QBASIC hacks for all the i386 computers in the background to the left. My favourite computer ever would have to be my Toshiba Libretto U100 ultra-light laptop. 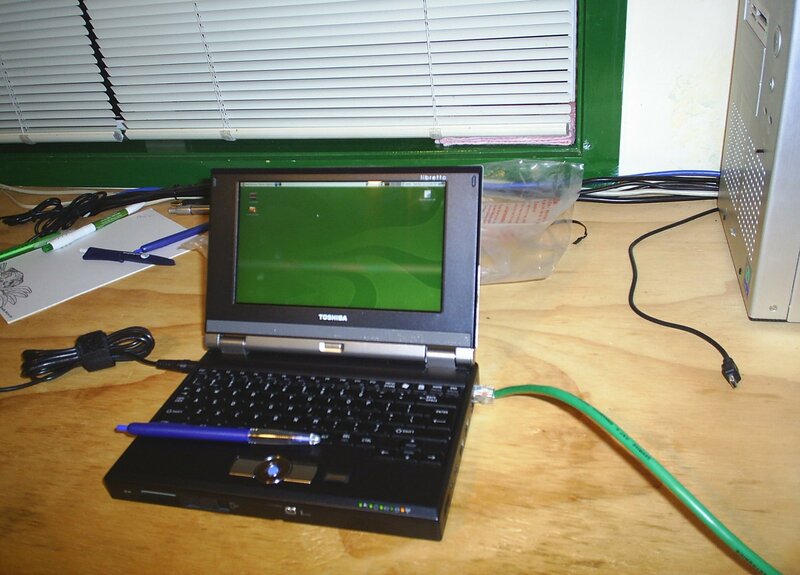 The Toshiba Libretto series predated netbooks and packed pretty serious punch for their time, with a Pentium M 1.2Ghz, 1GB RAM, 60GB disk and a sub 1KG weight. Most amazing was their 7″ LCD screen with 1280×768 resolution, it’s amazingly tiny to look at, I’m sure if I tried to use in 10 years from now I won’t be able to read it. Words and pictures can’t really describe how small or light this laptop is, it’s barely larger than a VHS tape and incredibly cute. I still have two of these laptops, however I had to upgrade this year, as the 1GB of RAM just couldn’t cut it any more and my almost 24×7 operation of the laptop since I got it in 2006 has left it slightly unstable and it had started crashing randomly. But definitely my favourite machine ever, they are quite amazing. :-) I’m starting a collection, currently have two of the U100s (both the white and the blue models) as well as an early classic Libretto 50CT. Libretto 50CT forever! It’s still one of the smaller computers around, and in addition it has an OPL chip, which is what created those plastic “MIDI” sounds of the early ’90s. With the rise of so called chip music, that aesthetic has once again come into fashion.